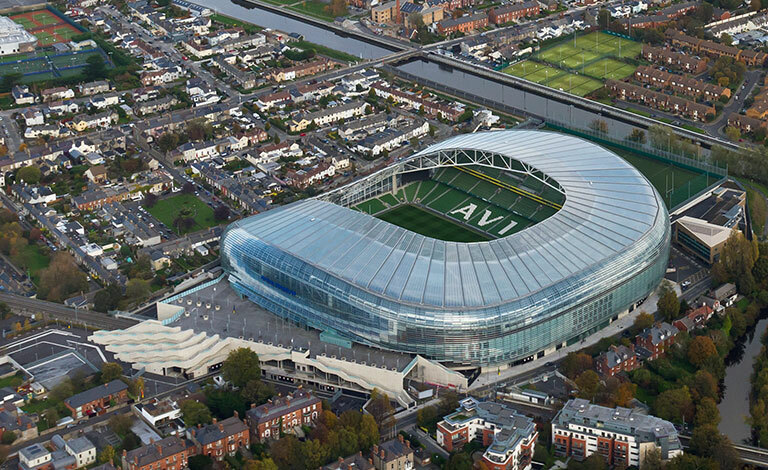 The new Aviva Stadium at Lansdowne Road in Dublin was developed by engineers Kentz Ireland Ltd on behalf of the Irish Rugby Football Union and the Football Association of Ireland. It has a capacity for 50,000 spectators who are able to enjoy a safe and secure experience with the minimum intrusion and inconvenience. ADT was responsible for the end-to-end delivery, maintenance and support of the stadium’s life safety and security systems, including fire detection, CCTV, access control, intruder alarms, gas extinguishers and disabled WC alarms. Each of these systems have been seamlessly integrated with the stadium’s Local Area Network (LAN) and IT infrastructure, enabling security operators or the Gardai to monitor and control each component from centralised workstations across the site, streamlining this process and helping to improve the efficiency and response time of operators to potential incidents. The stadium, Ireland’s first UEFA Elite football ground, has a purpose-built hi-tech communications nerve centre. ADT’s life safety and security systems allow for continuous monitoring of all aspects of the stadium, both inside and outside the ground. 192 CCTV cameras have been installed at ‘pinch points’ around the stadium, ensuring operators and police can quickly identify potential problems or flashpoints from within the stadium’s control room. Using ADT’s consolidated single-screen overview of all systems, operators can control multiple alarm input and outputs, which combined with audio and video verification of each protected zone within the stadium delivers an additional layer of protection. The Tyco Expert Graphics (TXG) system provides users with a graphical overview of fire detection, extinguisher and disabled call management systems and is also configured to automatically respond to events, even when the operator is away from the workstation.